Poutine lovers, rejoice! From April 12 to 20, you can fill up on classic, vegetarian/vegan and one-of-a-kind poutines during Calgary’s annual poutine extravaganza, which has been re-named Poutine With Purpose this year. Throughout the nine-day event, participating restaurants will offer their take on the popular dish, with some restaurants even offering more than one poutine dish to choose from. Around 80 restaurant locations are participating this year, including Trolley 5, Wurst, The Beltliner, The Guild, Tuk Tuk Thai, Citizen Brewing Company and more. Poutine With Purpose is also an opportunity to contribute to a great cause through your stomach — each time a participating restaurant sells its poutine dish, Mealshare matches that by giving someone in need a free meal. The Beltliner normally offers a perogy poutine, but during Poutine With Purpose, you can treat yourself to some goose poutine that really makes the most of the bird. The restaurant, which put slow roasted goose breast and confit leg in the poutine, also used rendered goose fat and a carcass stock to make the gravy. Cheese curds and crispy skin round out the dish. Fried chicken and poutine sounds like a match made in heaven, so we’re excited that that’s exactly what Cravings Market & Restaurant is offering this year. Available in a starter or meal size, the loaded Buffalo chicken poutine is made with two kinds of cheese (aged cheddar and cheese curds), two meats (Southern fried chicken and maple bacon), Buffalo hot sauce, jalapenos, sour cream and crispy onions. One of the more unique Poutine With Purpose offerings, Fox on 6th Pub is serving its poutine inside of a Yorkshire pudding, which is a baked, savoury English dish. The poutine itself features fries, plenty of veggies (think green peas, carrots and wild mushrooms), cheese curds, Baron of beef and red wine gravy. Poutine for brunch? You don’t have to ask us twice. Home and Away sets its poutine apart from the start by using tater tots instead of fries. Then, it’s topped with cheese curds, nacho cheese, chipotle crema, bacon, jalapenos, Southern hot spiced gravy, pico de gallo and an egg served sunny side up. 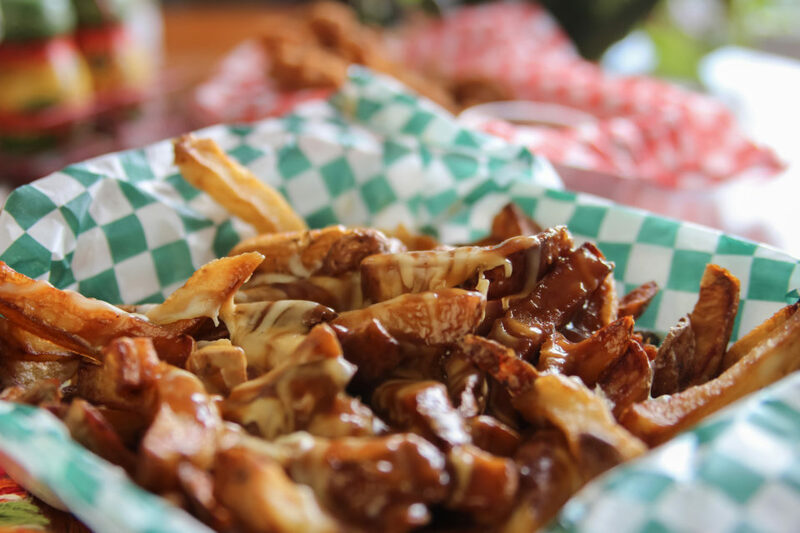 Prairie Dog Brewing has come up with two poutines for Poutine With Purpose: one for the poutine purists and one that’s perfect for sharing. The Prairie Dog Poutine keeps things simple with Kennebec fries topped with cheese cuds and Porter gravy. But if you want something a bit more inventive, try the Big Prairie Poutine. It can be shared between three to four people and features toppings like brisket, bacon lardons, pulled pork, nacho cheese sauce and more. If you’re heading to The Rec Room to play some arcade games between April 12 to 20, be sure to try its Poutine With Purpose offering too. The Poutine Supreme comes in small and large sizes and features beer cheese queso, sour cream, pickled jalapenos, spring onion and pico de gallo on top of fries. Pineapple on pizza can be a divisive subject, but we’re excited to try Trolley 5’s pineapple-inspired poutine creation. The cleverly named Hawaii Fry-Oh! has a classic base of fries, cheese curds and gravy, then ups the ante by adding slow smoked pulled pork, pineapple sauce, a house jerky crumble and a pineapple crisp.